Archimedes: Eureka! is a Worthy TMS Game Set in Ancient Greece. Mid Atlantic Consulting APP review today. There are lots of very well known time and/or resource management games around. We’re certainly fans of such favorites as Township, SimCity BuildIt, and Clash of Clans. That said we’re always on the lookout for a new contender. Are you ready to dive into ancient Greece? Well buckle up buckos and get going with Archimedes: Eureka!. Archimedes: Eureka! is a new time management strategy game that’s a lot of fun, full of ever-increasing challenges, and offers up some very inventive extra activities that will keep you engrossed for hours on end. 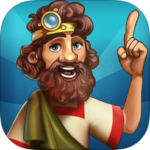 Like many city build up time management titles, Archimedes: Eureka!, which comes to us courtesy of Jetdogs Oy, is all about utilizing resources just the right way to balance income with the cost of building and improving. This can seem overwhelming at first so we appreciate the tutorial style intro to the game where Archimedes: Eureka! breaks it all down one activity at a time. The story line is that Archimedes inadvertenly destroyed the city and you start with a certain amount of resources that allow you to begin rebuilding the city. You begin by building houses that generate income and move on from there. If you stay with it you’ll be rewarded with a game that offers challenges and surprises, such as inventing new machines along with Archimedes. We loved this aspect of the game and think it can be expanded and developed further to a point where the game could be a very cool setting for an even larger focus on learning physics, architecture, as well as resource optimization and more. The graphics in Archimedes: Eureka! are a bit simplistic but fit just right for the game. They’re not horribly advanced or slick, but you really don’t need that and, more importantly, they are clear which is a must in this kind of game where planning and strategy count. The only ad in the game comes up when you see your progress and tries to get you to purchase the full version. You can compete with other users around the world via the Archimedes: Eureka! Hall of Fame (aka leader board), track your achievements and see your challenges. There’s a lot here to keep you engrossed, entertained and coming back for more. One other thing we’d like to point out is that while this is an excellent iPad game, it’s less so on an iPhone. Playing it on an iPhone can be quite challenging. It’s hard to touch exactly what you want and it’s impossible to read the goals for the level without a magnifying glass. While Archimedes: Eureka! is free to download and play, you’ll have to pony up for the full version if you really want to get the most out of it. That’s not a bad thing! There’s plenty to gain by shelling out the cost of the upgrade ($6.99). The good news is that you get plenty enough for free to figure out if this game if for you and, if you’re like us, you’ll very likely get addicted to it straight away. We give Archimedes: Eureka! a hearty recommendation because it’s fun, inventive, challenging and you don’t have to pay a dime to check it out. What’s not to like? Archimedes: Eureka! requires iOS 8.0 or later and is compatible with iPhone, iPad, and iPod touch.